Dhantrayodashi which is also known as Dhanteras is the first day of five days long Diwali festivities. On the day of Dhantrayodashi, Goddess Lakshmi came out of the ocean during the churning of the Milky Sea. Hence, Goddess Lakshmi, along with Lord Kubera who is the God of wealth, is worshipped on the auspicious day of Trayodashi. However, Lakshmi Puja on Amavasya after two days of Dhantrayodashi is considered more significant. Lakshmi Puja on Dhanteras or Dhantrayodashi should be done during Pradosh Kaal which starts after sunset and approximately lasts for 2 hours and 24 minutes. We don't advise to choose Choghadiya Muhurat to perform Dhanteras Puja as those Muhurtas are good only for travelling. The best time for Lakshmi Puja on Dhanteras is during Pradosh Kaal when Sthir Lagna prevails. Sthir means fixed i.e. not moveable. 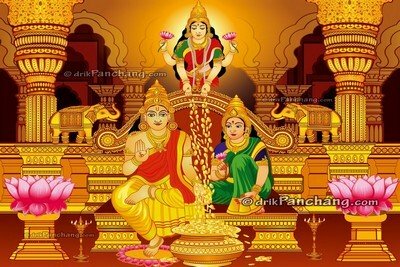 If Dhanteras Puja is done during Sthir Lagna, Lakshmiji will stay in your home; hence this time is the best for Dhanteras Pujan. Vrishabha Lagna is considered as Sthir and mostly overlaps with Pradosh Kaal during Diwali festivity. We provide exact window for Dhanteras Puja. Our Muhurat times contain Pradosh Kaal and Sthir Lagna while Trayodashi is prevailing. We provide Muhurat based on location, hence you should select your city first before noting down Shubh Dhanteras Puja timings. Dhanteras Puja is also known as Dhantrayodashi. The day of Dhanteras is also observed as Dhanwantari Triodasi or Dhanvantri Jayanti, the birth anniversary of the God of Ayurveda. Yamadeep is another ritual on the same Trayodashi Tithi when the lamp for the God of death is lit outside home to ward off any untimely death of any family members. The whole team of www.drikpanchang.com wishes you happy and prosperous Dhantrayodashi.